Former world champion goose caller and call maker Tim Grounds of Johnston City was killed in an ATV accident at his Williamson County hunting club Sunday. JOHNSTON CITY — Goose calling legend and call-maker extraordinaire Tim Grounds, 60, of Johnston City, was killed on Sunday in an accident at his hunting club in rural Williamson County. Grounds had apparently been spraying weeds on the side of an embankment when his ATV overturned and landed atop of him. A statement from the Williamson County Cororer’s Office said when Grounds failed to return, home friends went to look for him and found him beneath the ATV. A lifelong waterfowl enthusiast, Grounds parlayed his passion and talents into an international business, Tim Grounds Championship Calls. He burst into the national waterfowling spotlight by winning the World Championships in Easton, Maryland in 1988, 1992 and 1994. But, Grounds was more than a successful caller and businessman. Grounds’ family posted this statement on Facebook, “Hunter, his dad and I want to thank each or you for your loyalty to Tim all through the years. He loved GOD, geese, his work, his friends – he loved life. He taught so many and was generous to a fault. HE WAS THE #1 GOOSEMAN. And, if you were his friend, he had your back and you knew it.” The statement as signed by his son, Hunter, and his mother and father, Bill and Juda Grounds. Grounds’ generosity and enthusiasm to teach others was a common theme. “I’m so sad,” said Dwight Hoffard of Johnston City, longtime organizer of the Southern Illinois Celebration of National Hunting and Fishing Days. “Tim was a unique individual, but he had a heart as big as a basketball. He always was in the middle of everything. He loved his sport and was always anxious to pass it along to the young folks. Tim was a good guy in a lot of ways. I hope people realize that. That first contest was small in scale, but eventually became recognized as one of the premier calling contests in the nation. The event drew callers from throughout the United States to National Hunting and Fishing Days. After his calling career ended, Grounds remained a giant in the business by continuing to create new calls. He was also active in making hunting videos. “You know what, competing against him, he would drive you to get better,” Dishner said. “It ain’t going to be the same. There are other call makers out there, but there was only one Tim. He did it for the money, but he also did it because that was what he loved doing. 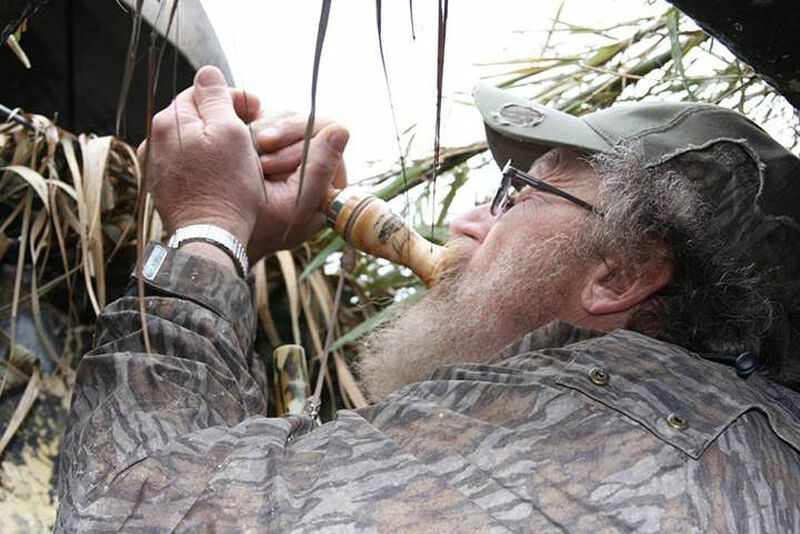 Dishner said Grounds’ “Half Breed”, a short-reed call, revolutionized the calling world. “It just stormed the market,” he said. “It was totally different than the flute call. Feb. 22, 2018, at 5:34 p.m.
FRANKFORT, Ky. (AP) — Hundreds more sandhill cranes could be hunted in Kentuckyunder a proposal from state wildlife officials. The plan would end a 400-bird limit on harvest and allow as many as 1,400 cranes to be taken each year, depending on population estimates, the Courier Journal reported Monday. Sandhills migrate from the Great Lakes region to Florida through Kentucky. They stand as tall as 5 feet (1.5 meters) with a wingspan of roughly 6 feet (1.8 meters). Among other proposals are changing the hunting season’s length from 30 to 56 days and extending it two weeks later to the end of January. Another is creating a no-hunting zone in Green River Lake to protect a newly discovered area where the birds gather to rest. The changes are headed for approval to the Kentucky Fish and Wildlife Commission, which has its next meeting March 9. Changing crane-hunting regulations would require approval from the commission and the General Assembly. John H. Brunjes, coordinator of the state’s Migratory Bird Program, said some changes are meant to simplify regulations while others are designed to increase conservation. Tim Grunewald, North America program director of the Wisconsin-based International Crane Foundation, said the foundation had opposed the hunt that started in 2011 and also opposed any expanded hunting. HELENA, Mont. (AP) — A grizzly bear mauled a bow hunter in southwestern Montana, slashing a 16-inch (41-centimeter) cut in his head that required 90 stitches to close. “I could hear bones crunching, just like you read about,” said Tom Sommer, as he recovered in a Montana hospital on Tuesday afternoon. Sommer said he and a hunting partner were looking for an elk they had been calling Monday morning when his partner spotted a grizzly bear feeding on an elk carcass in the southern end of the Gravelly Range, just north of the Idaho border. “The bear just flat-out charged us,” Sommer said. He said it closed the 30-foot (9-meter) distance in 3 or 4 seconds. His hunting partner deployed his bear spray, which slowed the bear’s charge. Sommer said he grabbed his canister so quickly that he couldn’t release the safety and he couldn’t afford to look down as the bear closed in. He ran around a tree twice and dropped his bear spray in the process. Sommer then grabbed his pistol and turned to confront the bear. “It bit my thigh, ran his claws through my wrist and proceeded to attack my head,” Sommer recalled Tuesday. He still had his pistol in his hand and was going to shoot the bear in the neck when it swatted his arm down, Sommer said. “Just like that it stopped. He stopped biting me, he got up and started to run away,” said Sommer, who splits his time among Idaho, Missouri and Florida. His hunting partner had been able to deploy the rest of his bear spray, ending the attack Sommer estimated lasted about 25 seconds. “It could have been a lot worse,” he said. Sommer found his bear spray canister. His hunting partner had some blood coagulation powder and they made a turban, stopping the bleeding after about 15 minutes. They walked a mile back to their spike camp and rode mules another 4 miles (6.4 kilometers) out to their base camp, followed by a 2-hour ride in a pickup truck to get to the hospital in Ennis. VINELAND — A teen was accidentally shot while hunting near the border of Vineland and Buena Vista Township Saturday with two friends, authorities said. A group of teenagers were hunting waterfowl around 6 p.m. when an 18-year-old boy was struck in the arm with birdshot and taken to Cooper University Hospital in Camden with non-life-threatening injuries, police said. New Jersey State Police told The Press of Atlantic City they first responded to the scene and then handed over the case to Vineland police. The 18-year-old was struck with birdshot from a gun that was being used by one of his friends, who were both minors. Police are not releasing the names of the victim or his friends at this time. Lt. Steve Triantos said the shooting appeared to be from an accidental discharge and Vineland Police are continuing to investigate, including sending the shotgun to a police lab. Although the area contains some rural and wooded areas, Triantos said hunting accidents like this are not common. Never miss breaking news as it happens! Sign up now to receive alerts delivered to your inbox. CAMDEN, S.C. (AP) – Authorities say a 72-year-old man driving a four-wheeler has died after running into a dead tree covered by high grass. Kershaw County Coroner David West said Alan Wooten Sr. was pronounced dead around 9 a.m. Saturday at the scene of the wreck on a farm several miles south of Camden. West says Wooten was thrown over the front of the four-wheeler after hitting the tree. West said in a news release that Wooten was hunting with other people. 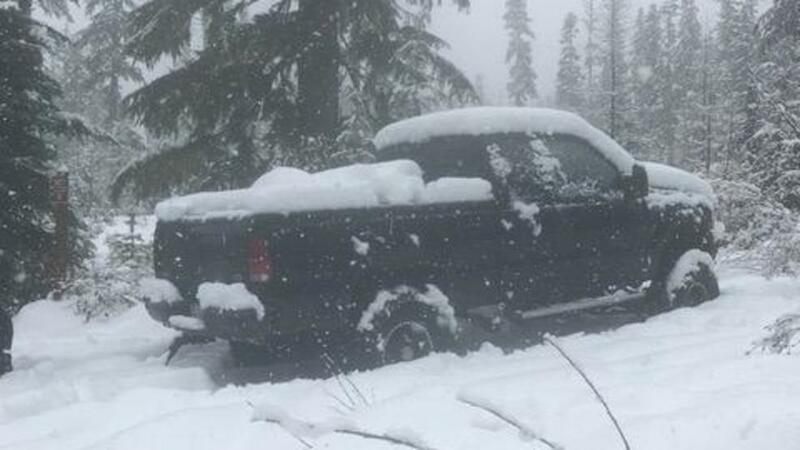 STEVENSON, Wash. — A Search and Rescue team has located the body of missing Vancouver hunter Joel Presler, who went missing earlier this month in the forlorn lakes area of the Gifford Pinchot National Forest. Authorities suspended the search for 37-year-old Presler last week, after four days of search efforts had not turned up any clues or evidence. Searchers had located his vehicle a few days prior. Presler last had contact with his family on November 11. Warmer temperatures this week resulted in the reduction of much of the snow in the search area, giving reason for searchers to return to the area. They located evidence and Presler’s body within close proximity to where his vehicle was parked. An autopsy will be conducted by the Clark County medical examiners office. There was nothing located at the scene to indicate anything suspicious regarding the death. The investigation is continuing in order to understand what led to Presler’s death. The St. Louis County Sheriff’s Office has released the name of the 16-year-old Aurora youth who died from a gunshot wound while in a deer stand Saturday. Corwin M. Johnson, 16, was found dead by a relative just before 5:30 p.m. Saturday in a deer stand near Stepetz Road in White Township, about 5 miles southwest of Aurora. Sgt. Steve Borchers said the gunshot appeared self-inflicted, that foul play is not suspected and that no other party is believed to be involved. Johnson was dropped off at his deer stand early Saturday morning by his uncle and hadn’t been seen until he was found deceased. A missing hunter was found dead Friday night in Schoharie County. Authorities say they received a call about the 59-year-old missing man from Connecticut around 4 p.m. Investigators are unsure when he left to go deer hunting in the Town of Richmondville. After an extensive search with multiple state agencies, the man was found dead in the woods. An autopsy is being done at Ellis Hospital. 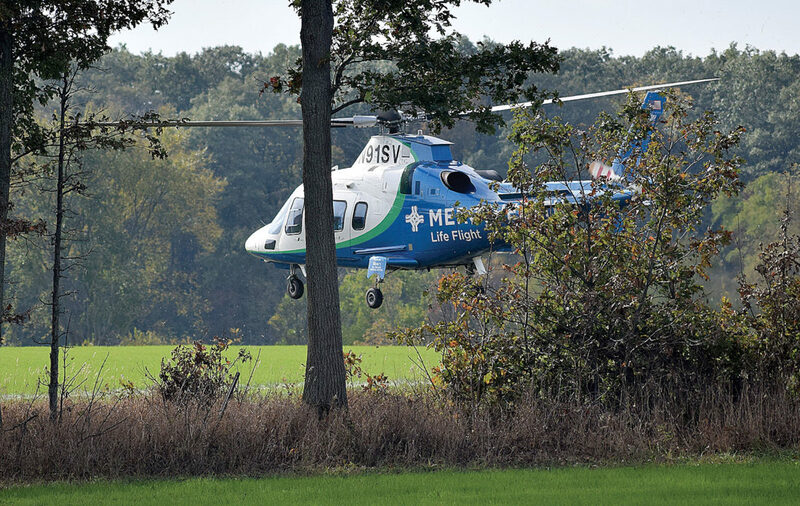 A Tiffin man was transported by Life Flight to Mercy Health – St. Vincent Medical Center after a hunting accident in a woods near TR 175 and CR 38 Saturday morning. Deputy Mark Lawson of Seneca County Sheriff’s Office said friends Ray Matthews and Marty McQuistion, both of Tiffin, were hunting squirrels when Matthews accidentally shot McQuistion. “They came together,” he said. McQuistion, who was shot once in his upper body, was taken by Life Flight to Mercy Health – St. Vincent Medical Center. He was in critical condition Saturday night, a hospital spokeswoman said. McQuistion was alert and conscious at the scene, Lawson said. PHOTO BY JILL GOSCHE Life Flight leaves the scene of a hunting accident near TR 175 and CR 38 Saturday morning. Lawson said Matthews shot at a squirrel, the squirrel ran and popped back up, and Matthews shot again. He didn’t think his friend was that close, Seneca County Sheriff Bill Eckelberry said. “He was focused on the squirrel,” Eckelberry said. The men were using shotguns, and Matthews said they were about 50 feet apart, Lawson said. Personnel from North Central EMS, Green Springs Rural Volunteer Fire Department, Scipio-Republic Fire Department, Seneca County Sheriff’s Office and Ohio Department of Natural Resources responded. Eckelberry said the sheriff’s office turned over the scene to ODNR to conduct the investigation. The incident was reported at 10:37 a.m., according to a sheriff’s office report.